(CBS) - Holiday shopping is around the corner and a new app called Slice will help you track purchases online. Slice works by pulling data, like confirmation numbers and tracking numbers, from your email. So, you'll have to sync the service with the email address you use to receive all of your online shipping data. If you're like me, syncing a service with my email is not something I like to do, so I reached out to Slice to discuss the measures the company is taking to secure user data. It turns out, the service is incredibly secure. I spoke with Slice chief executive officer Scott Brady, who ensured me the company uses the same encryption as major U.S. financial institutions. They go a step further and encrypt data at the item level, which means each piece of data they pull is scrambled and stored separately, so items cannot be associated with individuals. Brady even told me that when they troubleshoot customers, tech support has to use screen share because they cannot access your account. Once I installed the app, it was clear to me that Slice is a must-have tool for online shopping. The interface is easy for tracking multiple purchases and viewing my buying history. In some cases, they've seen purchase go back six years. I actually thought it was fun to see how I've spent my money through the years. 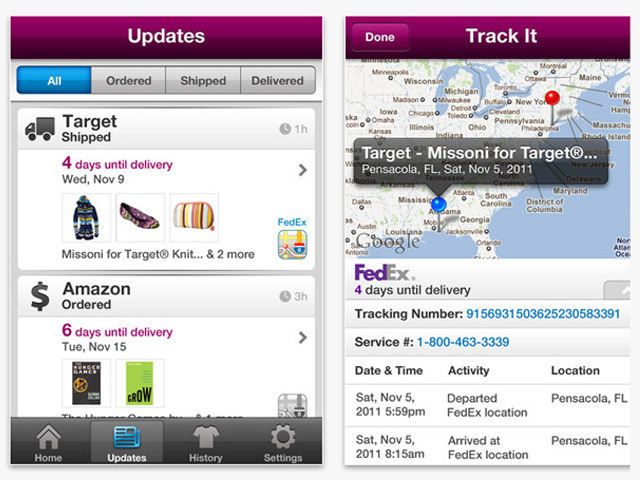 Slice searches your entire inbox, so don't be alarmed if you see your online shopping history pop up before your eyes. Brady mentioned that tracking all of your purchases through Slice is not a distant concept. Consider how the Apple Store works. They email your transaction rather than print out a receipt. As more companies evolve to that model, you could essentially be able to keep track of even physical purchases with Slice. Slice is backed by some of the biggest names in technology. FYI, Google's Eric Schmidt's venture capital firm Innovation Endeavors is an investor. Slice launched Tuesday for the iPhone and is available for free at the App Store.